A brain-controlled wheelchair has been developed at the University of Zaragoza. The non-invasive method to record the human neural activity was the EEG and the wheelchair was robotized and equipped with a laser sensor. When in operation, the user faces a screen displaying a real-time virtual reconstruction of the scenario and concentrates on the location of the space to reach. A visual stimulation process elicits the neurological phenomenon and the electroencephalogram (EEG) signal processing detects the target location. This location is transferred to the autonomous navigation system that drives the wheelchair to the desired location while avoiding collisions with obstacles in the environment detected by the laser scanner. This concept gives the user the flexibility to use the device in unknown and evolving scenarios. The prototype was validated with five healthy participants in three consecutive steps: screening (an analysis of three different groups of visual interface designs), virtual-environment driving, and driving sessions with the wheelchair. The first time I encountered the idea of a brain-controlled wheelchair was in The Menagerie, first broadcast in November of 1966. 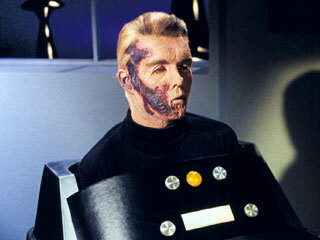 Captain Christopher Pike is confined to a wheelchair that can be moved forward, backward and turned by his thoughts alone. Read more at Mind-Controlled Wheelchair; via medGadget.